A Place for the Heart had another worship meeting and they had said last time that I could come and paint anytime. This meeting was called Cageless Birds. I was seeking God about what to paint, and on the phone with my sister one night when I opened the back door and there were lightning bugs everywhere. I tried to take photos of them, but none of them turned out, so I came on inside. 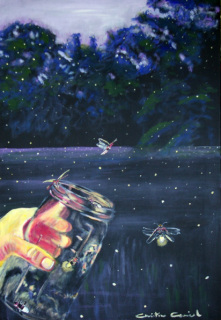 As I was looking at the photos I remembered I had a jar that would be perfect for catching them under my kitchen sink. The idea wouldn't leave me, so I grabbed the jar and went for it, even though I wondered what my neighbors would think if they saw me--I was compelled. There were so many, I quickly I caught a jar full of them. Just marveling at their beauty and the skill of the Creator. I took several photos and then let them go. When I did, some of them just flew out immediately. Some of them stayed on the bottom. Others took their time but eventually took off. I meditated on this and the painting just came to me. It represents being released to Fly, by fly I mean, be and do the stuff that God called us to. Many Christians spend their lives in a jar, but God made us to FLY. 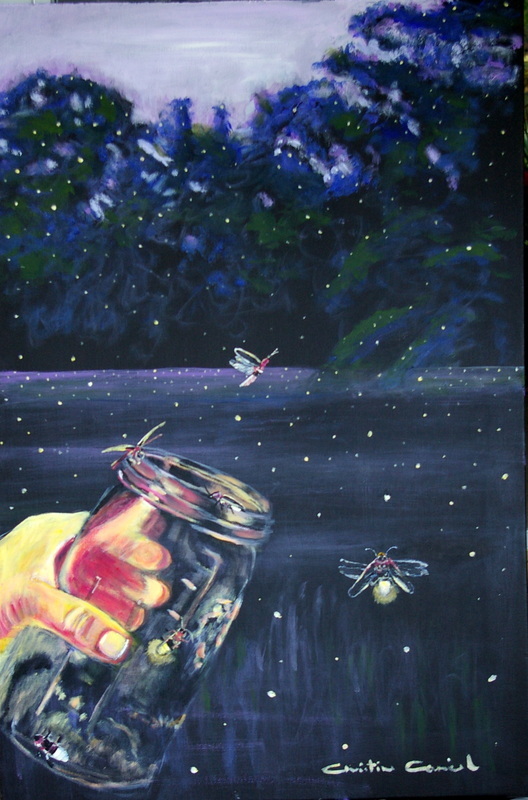 The lightning bugs in the painting represent the different stages of being released to be a minister. There is one on the bottom, he may not have realized that he is free, another on the wall of the jar that is glowing because he has realized that he is not too far from freedom. The two on the rim represents those preparing to take flight, and one has his wings already spread. Some are already flying, one has just taken off, and the the one in front, he is one that knows he is free, what he was created for, and is flying fully now displaying the Glory of the Lord. The ones in the trees are in high places, already being fruitful and multiplying. The first day of the meetings, I gave Ken the painting Safe Place. The Lord made it clear to me, it was his Prophetic Portrait. I didn't mention this before, but this time, he announced it at the meeting, so I feel ok to share it, he had been diagnosed with cancer, and is being treated for it. The painting, Safe Place was one of intercession and encouragement for him. I had such a burden for him as I painted it...even all the way to the meeting, I just wept over him. When I gave it to him, he said he was going to share it the next day with everyone. I encouraged him not to because I did not want the attention, but as a Papa, he was encouraging me to spread my wings, just a little more. So the next day he not only shared the painting, but then he asked me to come up and testify about it. Afterwards, he shared the testimony of his painting, Spread Your Wings, and sang the butterfly song from the CD God used to get me to paint. I was a mess...a puddle as I like to say, this was a true gift from God for me to experience. After I testified, 3 women came up to meet me. They said they had traveled 15 hours, from Boston, MA, to be at the meeting. I asked them what brought them so far, and they said they didn't know, they were artists and they just felt led because God just told them to come. I said, that is funny, that is where originally I had planned to go before I was led to stay home. Then I ended up painting Safe Place for Ken, I had just testified about. They said oh really, what church? I couldn't remember the name of the church right at that moment, but I remembered the name of the conference so I said it and they said...THAT IS OUR CHURCH!!! We all just laughed and marveled. They said they had felt so led to come and talk to me, they felt like I was their DNA, their family. When I didn't originally go to their church, one of the reasons was because I didn't know where I would stay. I didn't tell them that, but one of the ladies said to me, "When you come to Boston, you can stay with me." I had promised the Pastor, when I had cancelled my plans that I would come, one day...God was reminding me. "Pray that you do that which you love. Long ago I heard something from the writer and magnificent Christian, Watchman Nee, who said, "You know you are in the will of God when you do what you do and it is life back to you." That is what art has been to me: LIFE BACK TO ME. If it is to you, then do it with all your might. Blessings, Ken Helser"
Do everything readily and cheerfully—no bickering, no second-guessing allowed! Go out into the world uncorrupted, a breath of fresh air in this squalid and polluted society. Provide people with a glimpse of good living and of the living God. Carry the light-giving Message into the night so I'll have good cause to be proud of you on the day that Christ returns. You'll be living proof that I didn't go to all this work for nothing.